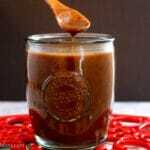 Homemade Enchilada Sauce, also known as Salsa Roja, is so easy you’ll never want to buy enchilada sauce again. And it’s ready in less than 15 minutes. Melt butter in a stovetop pan on medium heat. Whisk the flour into the butter to make a roux. Cook the flour, stirring constantly for about 1 minute. Add the beef broth and spices. Bring it to a boil and reduce it to a simmer for 10 minutes, stirring occasionally.